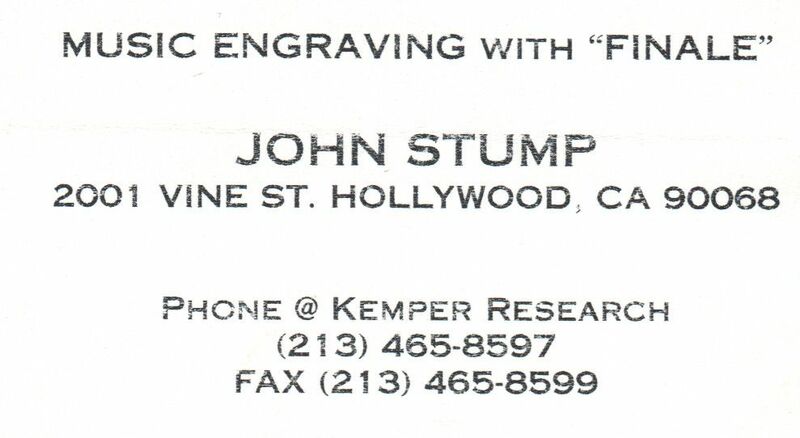 Six years ago today, my uncle, John Stump died. 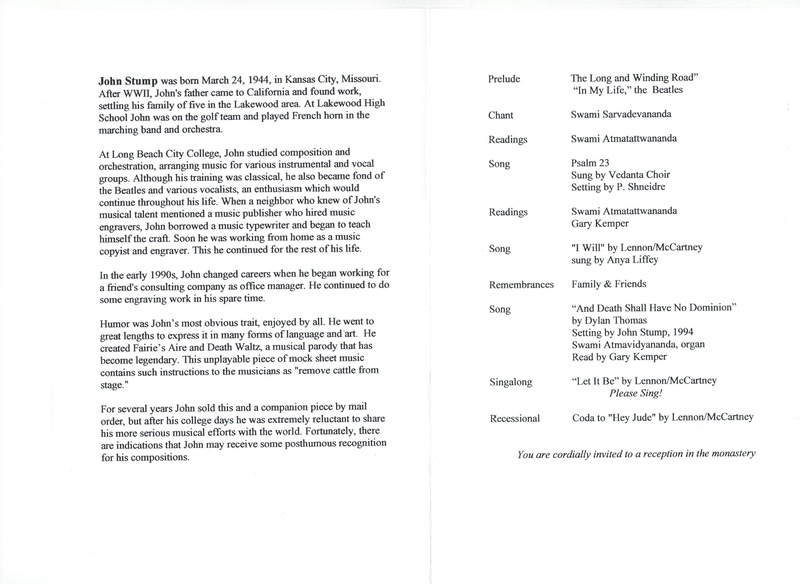 Shortly thereafter, I discovered that he had been the author of a number of pieces of sheet music, including “FAERIE’S AIRE and DEATH WALTZ,” which had a kind of legendary status online and a cult following among fans of musical absurdity. Almost two years ago, I wrote a post about John here on Lost in the Cloud in order to provide some actual information about him, being that he was somewhat of a mystery to the world (my younger brother created a Wikipedia page, which was up for a while, but the powers that be at that reputedly free and open encyclopedia closed down the entry for not having enough verifiable outside sources!). In the less than 2 years since I wrote that post, it has had 164,631 views. That number may not seem tremendously high for some websites, but Elijah and I are regularly astounded at the weekly average of 5,000 people who are interested in finding out more about John. 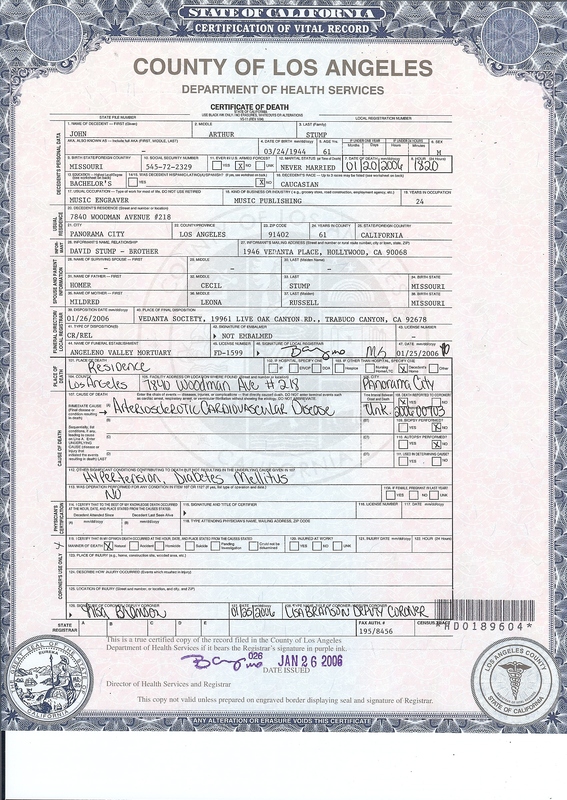 So, being that today is the anniversary of John’s death, I would like to celebrate my eccentric genius uncle by officially declaring January 20 to be Death Waltz Day and posting some random information and images from John’s life, beginning with his death certificate. 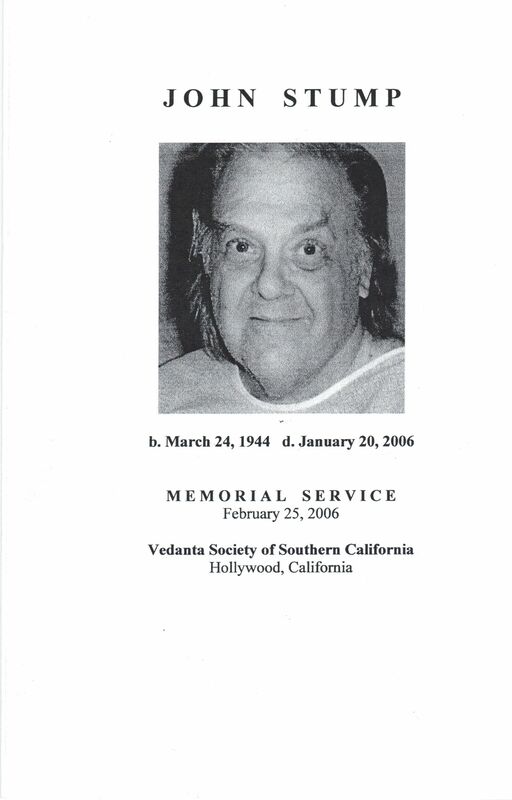 I’m also including a scan of the program cover and inside content from John’s memorial service, which was held at The Vedanta Society of Southern California, where my other uncle lives and works. Having the coda from “Hey Jude” as your funeral recessional is about the coolest thing imaginable. I wish I had been there to experience this first hand–I honestly cannot even remember the trivial matter that kept me from attending his service. 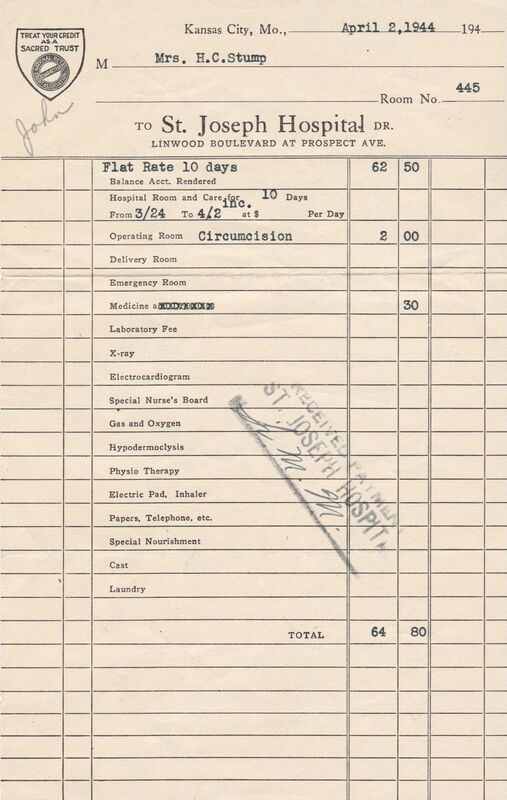 Reflecting the other end of John’s life, I wanted to post the actual hospital bill for his birth (total cost = $64.8o!) 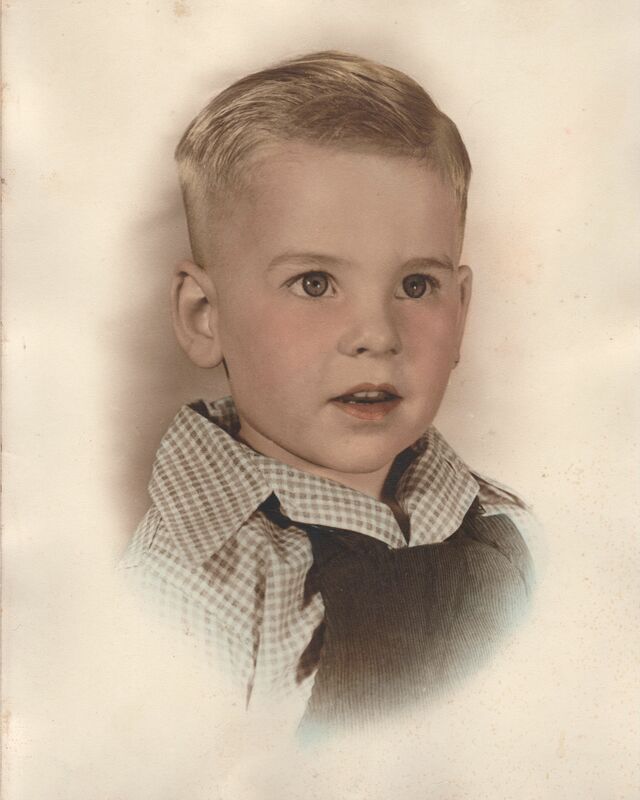 & a photo of a precious young John, probably around two or three years old. 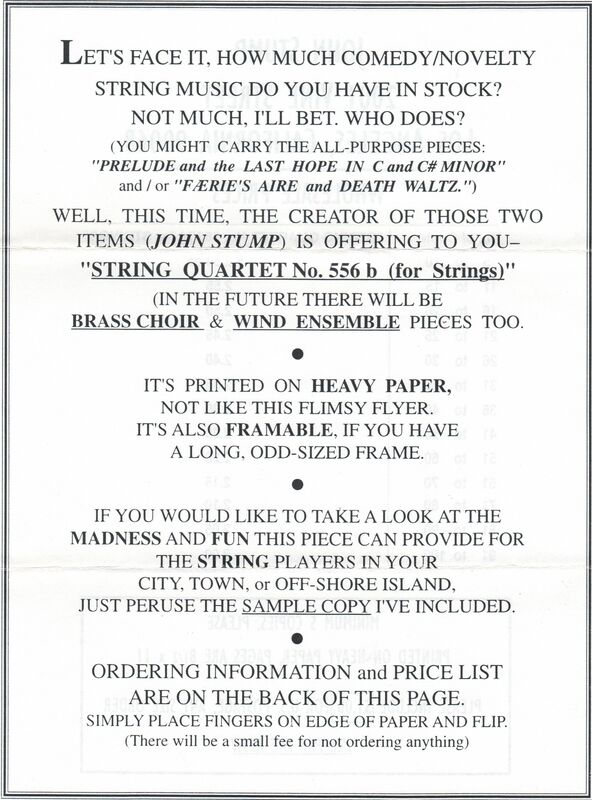 I thought I’d also share some rather funny promotional material that John used to sell his works, which he referred to as “musical novelties” and “gag sheet music,” along with John’s business card from his days as a music engraver. The correct name of this song is “U.N. Owen was Her”, remix by Cool&Create, piano version. The original author is Japanese composer Junya Ota, who goes by the alias of ZUN. He is known for his Touhou series computer games, from where the music comes from, which are extremely popular in Japan. More specifically, this bgm is from the game Touhou6: Embodiment of the Scarlet Devil. 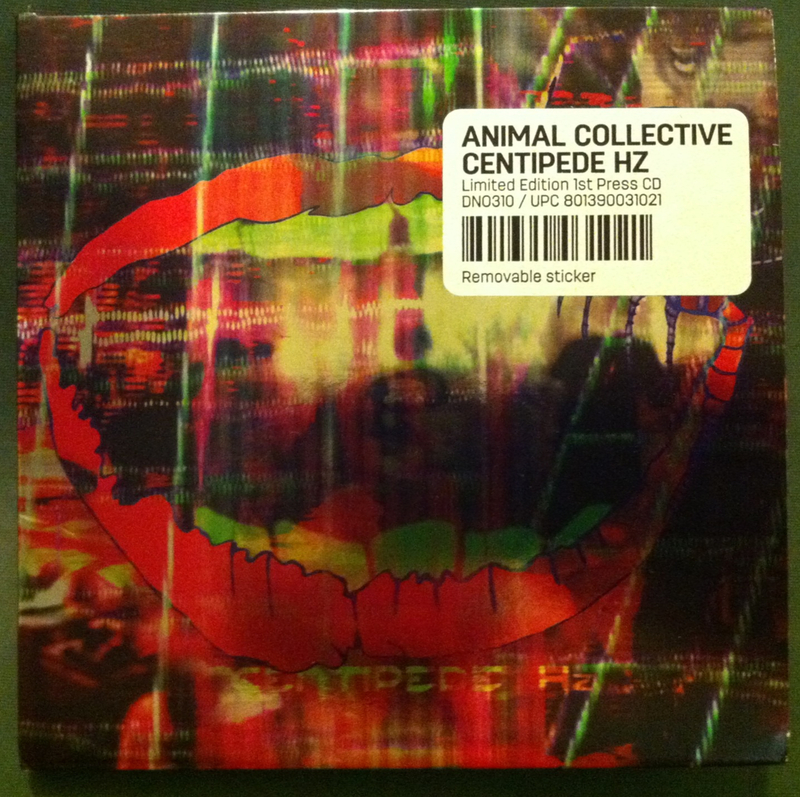 He is a very exceptional case because he is famous for single-handedly designing and programming his games AND composing all of the soundtracks, including this one. Hope that helps clear that all up! However, in honor of Death Waltz Day, I would like to issue a challenge to any music programmers out there to actually input John’s composition “Faerie’s Aire and Death Waltz” into some musical software program and send us the results of what it would sound like. It will probably sound like absolute cacophony and chaos, given that the composition was designed more for it’s visual and humorous flair and not for musical coherence, but we’ll never know unless we hear it for ourselves! 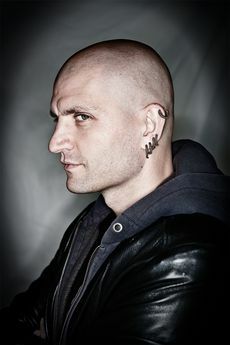 Miéville is primarily known as an author of science fiction/fantasy-esque novels, but they are eruditely creative, densely multilayered (political/spiritual/culturally reflective), and deeply engaging examples of those genres, that is, versus the kind that have implausibly-bosomed alien/elfin women in space/fairy bikinis. 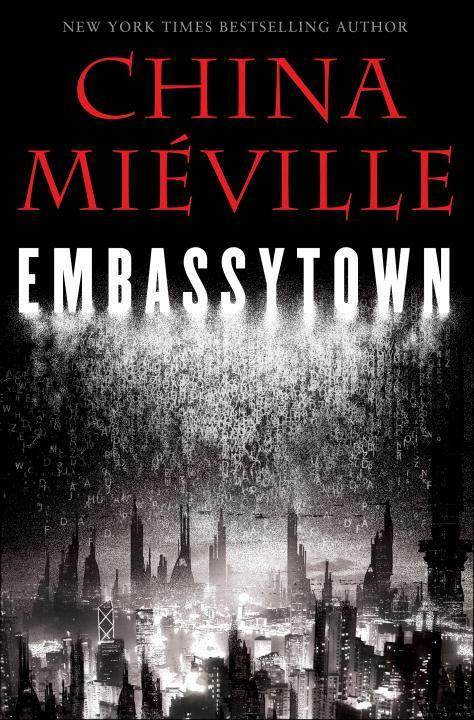 Supposedly, there is a “school” of writing to which Miéville belongs called the “New Weird.” I don’t know about weird, I just think it’s devastatingly clever. Except when it’s not (see Cloud Rank below for works that fall in the AVOID category). I initially found myself simultaneously intrigued and baffled by the world he created (aliens, technology, politics, etc. ), yet I was willing to patiently uncover the meaning of words like “miab” or “immer” by their use in context. However, I later became a bit bored with this lexical snipe-hunt, being that some words’ meaning seemed almost indeterminable. Still, the wordsmithery of this writer cannot be denied. In terms of literary pedigree, I found myself sensing the influence of two works quite strongly in his novel (though he may have read neither): Ursula LeGuin’s The Left Hand of Darkness (if you’re ever in a used bookshop, look for this & buy a pulpy copy…it’s so worth reading) with its androgynous sexuality and ambassadorial politics, and C.S. Lewis’ Perelandra (I’m pretty sure that Miéville would not be a fan of Lewis, given his harsh words regarding Tolkien) with its re-imagined Edenic narrative and grand human themes. If you liked either of those books, I think you would enjoy their offspring in Embassytown. The book had the potential to be a microcosmic epic, an unveiling of life in a particular place that seemed to speak to the totality of universal existence. But ultimately, it lost steam on this quest and became a story that was crushed by its own inability to live up to the grand vision it had promised. And yet, this book is so much better than most of whatever else that is published every year, so it comes highly recommended nevertheless. • A number of my favorite novelists have new books that have recently been or will shortly be published. Along with a brief review of their latest work, I’d like to begin a new feature called, “The Cloud Rank” where I assess and position the rest of their oeuvre (or as many of their novels as I’ve read) against the new work. Some of the novelists receiving this treatment will include: David Lodge, China Mieville, Tom Perrota, Julian Barnes, and graphic novelist Craig Thompson. • You may also expect a response to this article about hell from the Summer issue of Biola University’s magazine. I’ve largely worked through my issues with Biola, my former employer, so you need not expect a diatribe against the conservative evangelical establishment, and I find that I am generally opposed to the the Rob Bell book on eschatology that the Biola article denounces as well. Rather, some points that the “expert” author makes about annihilationism are quite ill-founded and need a corrective voice to balance out, which I am happy to provide! • I am also looking forward to reading the upcoming “multiple-views” volume on the topic of evangelicalism (about which John Stackhouse writes here) and adding some thoughts about the schism that seems imminent in the evangelical consensus and ways that we might avoid committing or being the victim of a “friendly-fire” tragedy. • I am also hoping to do a Cloud Rank on the albums of The Smiths and Morrissey, hopefully publishing a Top 50 Smiths/Morrissey Songs list in the process. • Finally, as we draw closer to the end of the year, you can count on Elijah and I to continue the long tradition of our best of the year in music here on Lost in the Cloud. 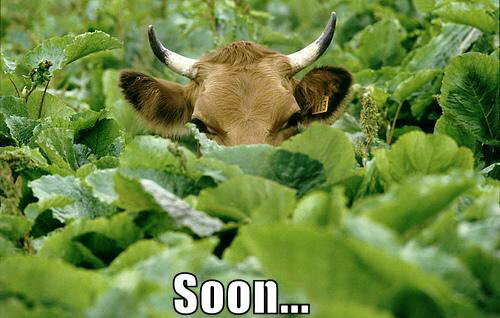 I offer my deepest apologies for this long absence and hope you will enjoy some of the posts in the days ahead!